Over the past decade very few industries have experienced the pace of transformation as much as the retail sector. Driven by competition from innovative online merchants, traditional retailers are having to adapt quickly and transform themselves into efficient omnichannel players to successfully carve out an enduring competitive advantage. The evolving shopping habits and customer preferences makes this strategic shift challenging. Customers across every demographic are becoming digitally savvy – getting their cues from social media while comparing products and pricing on the web. They are even comfortable placing orders for large, durable items online. Such trends and shifting customer preferences require retailers to market to their target customers digitally and engage them contextually via online advertising, social media, email, and SMS messages in real-time. This requires handling large streams of data in real-time and making decisions instantaneously. As retailers expand their strategy to include multiple channels, they are having to monitor and manage an ever increasing and complex set of operations such as fleet management, inventory optimization, anomaly detection within point-of-sale transactions, and much more. These, too, require processing and analytics of real-time data streams. To engage their customers and make key operational decisions, retailers across a broad spectrum are turning to Azure Stream Analytics. 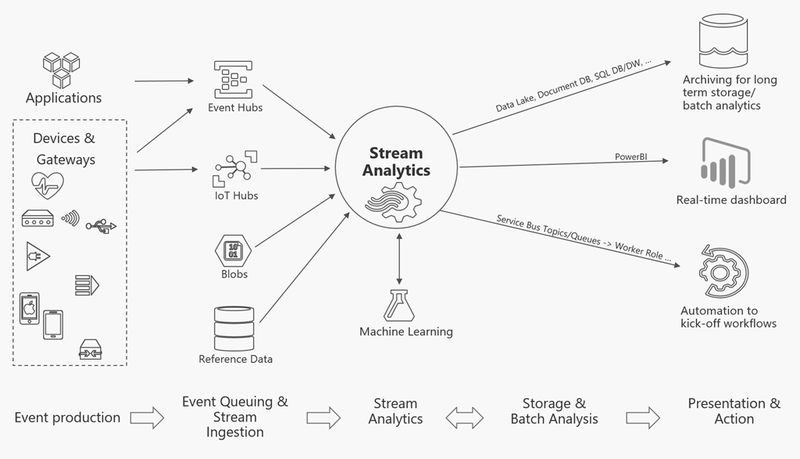 Using Azure Stream Analytics, customers can uncover insights from data generated by clickstream logs, transaction logs, devices, sensors, and applications with sub-second latencies. These insights can help generate alerts, power rich visual dashboards, and kick off workflows based on a pre-determined logic. A recent customer case study for Azure Stream Analytics features Worldsmart, the largest point of sale (POS) technology provider to independent grocery retailers in Australia. By using emerging cutting edge technologies such as Stream Analytics and R Server, they were able to successfully provide real-time machine learning forecasts and analytics to their retail customers. These advancements are helping companies innovate beyond providing just traditional POS systems, and is allowing them to position themselves amongst competitors. Real-time omnichannel promotions: Azure Stream Analytics enables retailers to pursue real-time customer engagement across multiple channels, while continuously updating and acting upon a 360-degree profile of their customers’ preferences and shopping patterns. This requires that retailers successfully handle huge volumes of website clickstream data alongside geolocation and proximity location data. This in turn helps them offer the right promotion at the right time to their customers whether they are online or in the store. Real-time website fraud detection and content monitoring: The content on a retail website is ever-changing with new products being launched and old products retiring. By using Azure Stream Analytics retailers can monitor all relevant information being added and removed, and more importantly detect any anomalies in real-time. Examples of anomalies include instances such as removal of a product with significant revenue, incomplete information for a new product onboarded such as a blank image or description, and use of offensive language within description, amongst others. Also, Azure Stream Analytics can help retailers identify and prevent fraud on the website in real-time and thereby minimize losses. For example, Azure Stream Analytics can be used for the identification of clickstream fraud, preventing potential denial of service attacks, identifying web content scraping by third parties, and monitor cardholder authentication bypasses with multiple tries. Real-time inventory replenishment and demand management: By matching current inventory levels with real-time point-of-sale transaction logs and online orders, retailers can predict potential stock-outs as well as extrapolate future demand trends. With these data points, they can automatically kick off necessary workflows to replenish inventory levels before stock-outs can occur and negatively affect profits and customer satisfaction levels. Fleet management and driver alerting: Most retailers have their own fleet of vehicles that they use to transport merchandise from distribution centers to stores, and sometimes between stores. Retailers want to ensure that these shipments are delivered in a timely and safe manner. To do so, they equip their fleet with sensors that generate telemetry such as vehicle geo positioning, driver alertness, fuel levels, and air pressure. These streams of data are continuously analyzed using Azure Stream Analytics and alerts are generated to help with scenarios such as vehicle re-routing in the wake of anticipated bad weather, alerting the driver to fill up gasoline if the next gas station is more than a certain distance away, and proactively alert the authorities in case of any mishaps. While the examples and benefits above are some of the more prevalent scenarios leveraging Azure Stream Analytics within our retail customer base, there are many other scenarios that are currently gaining prominence such as power conservation by reducing the store lighting by correlating current lighting brightness with ambient light and heatmapping the store’s foot traffic to help with better merchandise placement and staff allocation. Available globally across more than 30 regions, Azure Stream Analytics has ‘000s of customers worldwide. We welcome you to learn more about Azure Stream Analytics and give it a try today.